Home » Blogs » Do Tax Cuts Pay For Themselves? Some advocates of tax cuts have suggested such cuts will not lose revenue since they will spur economic growth and thus produce enough additional tax revenue to pay for the direct cost of the cuts. Although it is theoretically possible for tax rates to be so high and disruptive that a rate cut would pay for itself, there is practically no evidence to suggest this would occur with today’s tax code. 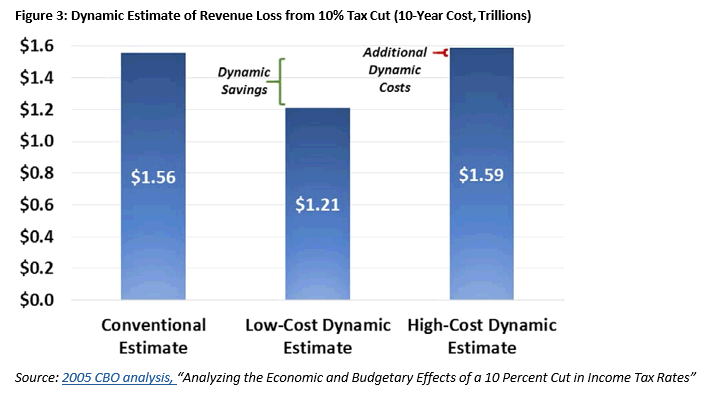 More likely, tax cuts may generate enough additional economic growth to replace a small share of the revenue loss. A number of economic studies confirm this finding. For example, a 2005 study from Greg Mankiw and Matthew Weinzierl found that tax cuts could pay for between 15 and 32 percent of their initial cost. A 2014 paper by Bill Gale and Andrew Samwick surveyed existing economic literature and concluded tax cuts might not produce any significant economic growth, in part because they result in higher debt. Finally, a 2005 CBO analysis found the economic growth from a 10 percent cut in individual income tax rates would at best recover 28 percent of the lost revenue and at worst further increase deficits slightly due to the negative economic impact of higher deficits. The bottom line is that while tax cuts can help accelerate economic growth in some circumstances, they will not generate anywhere close to enough growth to fully offset the revenue losses they create.